If Donald Trump’s election demonstrates anything about Latino voters, it’s that the concept of Latinos as a unified voting bloc or as a homogenous ethnic group is largely incoherent. Notions of Latino identity, or “Latinidad,” are complicated by national origin, immigration status, class, race, and gender. This complexity must be acknowledged by journalists who wish to write about Latinos, politicians aiming to harness their votes, and organizations that hope to build coalitions from disparate communities. The difference between how Cuban Americans might feel about immigration policy and how Mexican Americans might feel represents just a slice of nuance within Latino identity that was overlooked throughout the 2016 presidential race. The percentage of Latinos who cast ballots for Trump is in dispute. But whether it’s 19 percent, as reported by Pew, or 29 percent according to exit polls, many are shocked that Trump received any significant Latino support. After months of disparaging Mexican immigrants, talk of building a border wall, and warnings of “taco trucks on every corner,” many assumed that Latinos would present an anti-Trump voting bloc of historic proportions. But the idea that Latinos in the United States would coalesce into a unified body assumes that Latinos share a linked fate, political perspective, class politics, common history, and relationship to white supremacy: fundamentally, it seeks to homogenize the diverse. While Latinos often share a language, colonial history, and histories of immigration, there are many significant differences between them. For reasons specific to each group, even nationals of the same country do not represent a racial, cultural, or political monolith. 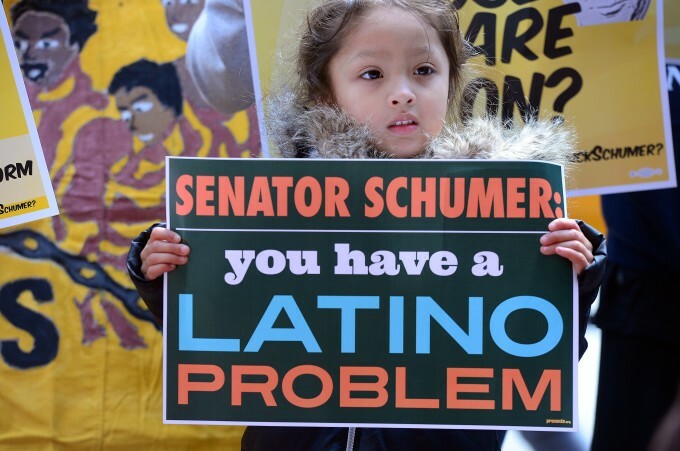 When the media reports there are 57 million Latinos in the U.S., for example, what is meant is that there are 36 million Mexicans, 5 million Puerto Ricans, 2.2 million Salvadorans, and millions more from the Caribbean, Central and South America. In ignoring just that distinction, journalists and politicians miss the mark for millions of people. And while it’s true that Latinos are largely Democrats and generally vote for Democratic candidates in presidential elections, Latinos are no strangers to the Republican Party. In 1984, Ronald Reagan garnered 37 percent of the Latino vote nationally. In Florida, he dominated among mostly anti-communist Cubans, winning 80 percent of the Latino vote to chants of “¡viva Reagan!” Yet in Texas, Reagan only received 35 percent of the (largely Mexican) Latino vote. These fault lines persisted 20 years later when George W. Bush performed similarly in both states. Ultimately, Latinos are a unique constellation. So why did the media portray Trump’s performance with Latinos as an anomaly? Perhaps some publications were surprised that any Latinos would vote for a man who referred to Mexicans as rapists and touted plans to build a border wall. But the Florida Cubans who voted for Trump, 54 percent, likely weren’t jolted by his immigration rhetoric, as he targeted Mexicans and not Cuban migrants, who can access a unique immigration pathway dictated by U.S. policy. The difference between how Cuban Americans might feel about immigration policy and how Mexican Americans might feel represents just a slice of nuance within Latino identity that was overlooked throughout the 2016 presidential race—and it wasn’t just the media. The Clinton campaign also demonstrated a fundamental misunderstanding of Latinos in its ham-fisted pandering—from “7 Things Hillary Has In Common With Your Abuela” to its glamorization of Tim Kaine’s ability to speak Spanish. Perhaps politicians and members of the media miss the nuance within Latino identity because of their desire and tendency to reduce people of color to two-dimensional characters. In the case of Latinos, that means reducing them to a single Spanish-speaking, ambiguously light-brown race without cultural specifics or varied histories and concerns. Ultimately, Latinos are a unique constellation. Some have been in the United States for generations, some had the United States’s borders cross them, and still others are just arriving. Some speak Spanish, some English, some both -- and yet others speak indigenous languages. They may be of African, indigenous or European descent, or some combination. Immigration brings them to similar enclaves; because they share language and a sense of some connection, they may partake in one another’s music and food, intermarry and care profoundly for each other’s struggles. To imagine that all Latinos have the same political needs and identities is a serious miscalculation, one that contributed to the Democrats’ loss this year and one that could cost them many elections to come.